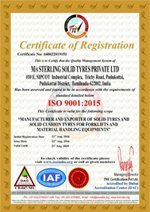 Sterling is a well known brand worldwide, in the field of Solid Tyres. It is manufactured in India by well experienced and qualified personnel in this field. It is manufactured in an ISO 9001:2000 certified facility adhering to stringent quality control process and superior construction techniques. 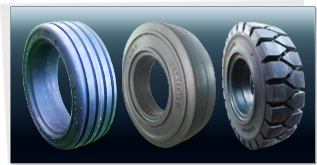 At we use 100% Natural rubber compound in multi stage construction, which offers low rolling resistance, reduces heat built up, increases chunk and tear resistance thus enhancing life. Material handling .. today .. is not just forklift trucks. 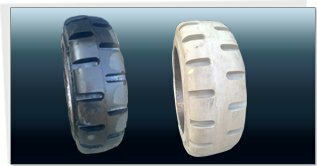 It’s also earth moving, construction, mining and airport ground support equipments provides the range of tyres what the industry needs.